That's not really important to you guys. What is important, and is something I need your help on, is Building some underlying Lore concepts that I can use & 'Deconstructing' them to something realistic. This is in part due to my desire to create a cohesive story, set post-TFT, that deals with the Trolls and their ascension to an Empire. However, I've never seen a campaign take it "from the Trolls' viewpoint" before, so I'm trying hard not to make this a campaign of weed-smoking hippies throwing spears & doing voodoo. I believe the Trolls have a vibrant & manifold culture with spiritual, tribal, combat-ical, hierarchical, cultural, and other-al facets, and I wanna represent that as best (plausibly & interestingly) as I can. Troll Mysticism! So we've got a definite bias/angle of "spiritualism" (belief that all matter has a 'soul' which can be discussed/bargained/ridden with; primary point of ritual & incancations & somatic & material components to spells is to converse/appease/convince/coerce these spirits to do things)... But just as much a strong "alchemical" bent (with potions, brews, elixirs.... witch doctors & "headshrinkers" (?) and "medicine men (mon)" (?)... ). Which is which? Are they differentiable, or are they two parts of the same thing? If separable, which takes which kind of 'position' in society (i.e. is alchemy an every-troll-man thing, with spiritualism being a sort of "higher echelon"/"years of study"/"lifestyle choice" dealie? Or vice versa? What kind of problems do they solve? Troll Mysticism: Concepts! (1st, Quick Question for you WoW-ites: Is there ever any mention of what exactly "Voodoo" is? What about the words "Tiki", "Mojo", or "Juju"? If not, are these common to your respective cultures, or common to something you would expect to see in a given faction such as this?) I'm looking for a bit of fleshing out of the generic, nameless "spiritualism", as well. At one point I had a nice little system of 4 named "styles" of spiritualism/alchemy, each covering a sort of "quadrant" (alignment-chart-style) of Troll magicks. I've since effectively discarded it (for some good reasons), but some relics remain, & I ponder their efficacy. TL;DR, I'd like some reasonably good way to categorize/define/systematize/codify Trollish magicks. Troll Mythology! What is said about the Troll's Loa that they worship and where they came from? I am aware that certain 'spiritually ascended' individuals can become regarded as Loa to the Trolls; how strong of a facet is this in WoW, would you say? How ancient are the Loa; are they all of the same antiquity? Can one pick random attributes & assign Loa to them arbitrarily? Etc. Troll Architecture! What could be said about Troll architecture? At once I see two strong 'schools of thought'; the "ancient Mesoamerican style" (primarily stone, ornamental wood, giant ziggurats & temples, altars, etc), and the "primal/tribal degenerate style" (primarily wood, mostly hollowed logs, flimsy & insecure, draped with ritualistic symbols & paraphernalia , etc). I personally prefer & would love to see more of the former, but the latter is not only easier/more reliable to have done, but also tends to look more fitting in the game. A mixture of both would be... Interesting. (NOTE: This question is coming both from a "game mod efficacy" angle and from a "storyline/thematic efficacy" angle. The former is determined somewhat by the availability of existing resources & the kindness of fellow artistically-inclined modders). Troll Linguistics! This is especially important for a campaign/sound-sets that I might wish to record voices for & concurrently have subtitles for... Part of what I love about the Trolls is the strong Jamaican-themed accent. It's cool, mon. But I recognize dat uh pau-ruh-graf fool o de s'trongest i'land'r acc-ent weell be enuff to de-ter de 'ardiest o' readahs. Mon. So what's the balance? How strong of a spoken accent should be showcased (granted, this'd be a grand total of 0 actual Jamaicans doing voices, so it's "as good as I & my wife & friends can get", lol)? And concurrently, in the subtitled campaign or any written version of this, how much is written "in accent"? What about their personal thoughts; do dey t'ink in Jamaican? How does WoW handle this? Probably more to come. Stay Tuned! Welcome to the club. Have a drink on the house. If you're interested in creating custom factions & heroes in Warcraft 3, I mod that over at The Hive Workshop (Also at Wc3C.net). Last edited by Khyrberos; 01-09-2015 at 02:00 PM..
Troll regeneration is a boon they got from some Loa, iirc. "True trolls" have shadow hunter leaders. Shamans, witch doctors and less spiritual leaders (warlords) are the kind of leaders trolls had to resort to due to forgetting their culture/heritage, afaik. Some loa predate trolls. Due to the trolls calling many spiritual beings, like Ancients, wisps or some of their ancestors, loa, not all loa are of the same antiquity nor are they all the same kind of being. Bwonsamdi, despite having appeared in the form of a troll, is older than the species, so appearances can be missleading. I'm not smart enough to know the answers to any of those and will not pretend to, but I anxiously await the chance to try the WC3 campaign. the game keeps making a weird noise, I hear it in wowcrendors playthough too, and I cant figure out what the noise is. So here's a fun little tidbit which is barely related to the topic. During a quest in Nagrand in which you bless the spirits of shadow hunters using a fetish of Bwonsamdi, the Loa is referred to as "The Lord of the Grave". In WoD? o.O Gods someone in blizzard lore screwed the pooch on that slip up. Seems the error may have been mine, actually. It was a fetish of Samedi, not Bwonsamdi. Curious that both have similar domains and names, but eh. Isn't Bwon supposed to be the Azerothian version of Samedi? It's weird that Azeroth has both. Huh. Still though, that is kind of a weird find. Why would the orcs, or ogres for that matter, have a Lord of the Grave? The orcs are ancestral spirit worshipers and I'm not sure what the ogres worship, if anything. I know the Draenei don't have a pantheon they worship. I wonder who the designers thought the lord of the Grave was supposed to be worshiped by. A troll gives you the item and quest. The ones you bless are her companions. Darkspear or Zandalari troll? Either way, having a troll hand you the item makes more sense, as long as its not a Draenor troll. One of Vol'jin's Shadow Hunters. Still weird that she calls Baron Samedi Samedi instead of Bwonsamdi. [*]Troll Architecture! What could be said about Troll architecture? At once I see two strong 'schools of thought'; the "ancient Mesoamerican style" (primarily stone, ornamental wood, giant ziggurats & temples, altars, etc), and the "primal/tribal degenerate style" (primarily wood, mostly hollowed logs, flimsy & insecure, draped with ritualistic symbols & paraphernalia , etc). I personally prefer & would love to see more of the former, but the latter is not only easier/more reliable to have done, but also tends to look more fitting in the game. A mixture of both would be... Interesting. (NOTE: This question is coming both from a "game mod efficacy" angle and from a "storyline/thematic efficacy" angle. The former is determined somewhat by the availability of existing resources & the kindness of fellow artistically-inclined modders). So, first off: If I address this from the mod efficency side alone: No question, "primal/tribal degenerate style". I check from time to time what modeling is done on hive, and from my PoV nowadays there isn't a lot of truely unique modeling done concerning race buildings. So if it must get done, then likely this way. Now, I'm not too keen on the idea as so much more could be done. This is in part due to my desire to create a cohesive story, set post-TFT, that deals with the Trolls and their ascension to an Empire. But again, from the modding side that makes it hard to achieve. I am handclaw and this is my favorite thread on Scrolls of Lore!... oh wait, nope... Just another bitching thread. I do so wish Darkspear Hold resembled an actual hold. OK... But what form does it take? How potent is it? Under what circumstances (spiritual or physical?) does it work & not work? Oh really? That's actually quite interesting; from where did you get that? Was this before, during, or after the whole "Hakkar" thing? Was this more characterized by their ancestral pre-Fall empire-time? Interesting, ok. Do we have any clues as to which Loa predate Trolls and which do not? What about the "Primal Loa" (panther/tiger/bat/snake/spider, I believe (though I'll be changing that))? And certainly they can change their shape, yet is there any evidence that they have/had a particular shape (/form/race)? Lol. I don't necessarily need "smart", so much as I need "literate" and "well-reasoned". Like I said, I'm giving myself a bit of "leeway" here (i.e. I don't feel beholden to stick to the "lore" that WoW has brought about, but may draw inspiration from it); as long as everything I make complies with TFT & such, I'll feel good about myself. So yeah, give me your thoughts. I like how topical you are. Well, it's kinda related. I suppose a good question is "what kind of Loa exist for the Trolls"? Are there only ones for the elements, or do we have some that are more metaphysical (e.g. "Death", "Life", "Love", etc)? Where do the "Primal Loa" (if they can be called such) stem from? Sure, they are simple huts, but they fit the jungle trolls so much better in my opinion. I'll admit, when I first saw them, I didn't particularly like them (as aforementioned, I like the Logs, and I'm not as big a fan of the bright, 'dead palm leaves' color scheme going on there. However, I do like the "parts of a ship" bit & the "stilts" bit... And what you say bears some looking into. i.e. There are plenty of times in Wc3 where Blizzard got resourceful (translation: lazy) and either re-used resources, re-colored textures (for different Creeps), or simply homogenized stuff. It could very well be argued that Trolls are one of them. In fact, to be fair the only Trollish architecture we witness in all of RoC are those (Forest) Troll log huts (2 kinds) & the Horde's "Burrow" (which in MPQ files is known as the "Troll Burrow" for some reason). Come TFT, we get one more; the Voodoo Lounge (which is, again, made up of Logs & voodoo paraphrenalia). 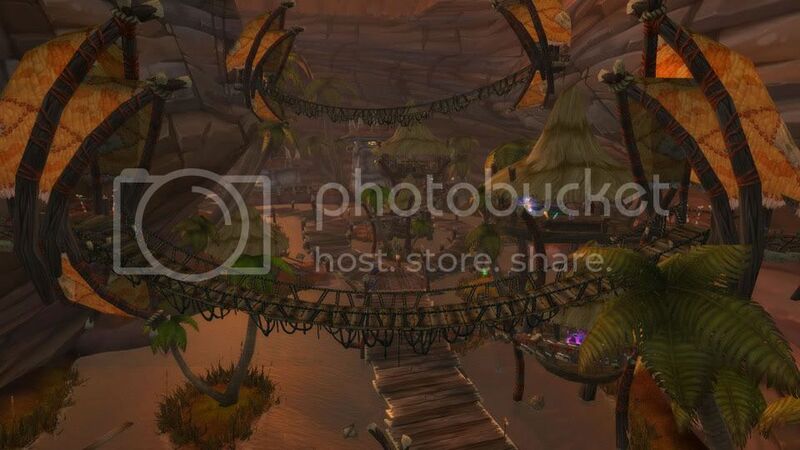 So... Well, actually now that I bring it up, the TFT Voodoo Lounge is a point against the "Blizzard lazily re-used resources but would've made J.Trolls different". However, your WoW pics are not. (Then again, I could further argue that in WoW, we see a nation supplanted; the Trolls are not in their native landscape (i.e. steamy jungles of Stranglethorn Vale) and are instead thrust into an entirely alien landscape (harsh, dry wastes of Kalimdor). Sure, they get the ocean-side view (Echo Isles), but they still don't have all the same resources with which to build their homes (i.e. instead of rotting logs & vines & trees & such, they have to use cured wood (e.g. parts of ships) & dry palm leaves to get the job done). That's absolutely golden. I'm glad I'm not the only one to think of that. : ) That's exactly what I'd love to do; Tier 1-2 buildings being Logs (TM) on stone foundations, "clinging to past glory"; Tier 2-3 buildings being primarily Stone & fancier & stuff. Well, ah dannae... I've been working with several modelers off & on, trying to convince them to get inspired by these ideas. My success has been... Limited. I have a few buildings, a few others that need major/minor tweaks, etc. I was working with one individual (jigrael/Tarrasque (you remember : )...), who's a great guy, done a lot for me in the past), who indicated he would like to whip up exactly the kind of Town Hall you're describing (3-tiered (stone) Ziggurat with Log stuff that gets bigger)... But he's incredibly busy, and I haven't heard from him in a while. Why, yes... Something very much like that, actually..
Should I talk louder? YOU NEED TO STOP MAKING MY FREAKIN' DAY, MAN. Dang, man, it's lookin' real neat. I particularly like "mega-mayan-ziggurat" feel. (How do you color the geosets like that; it really helps in visualizing it even before a texture goes on.) As always, your great execution of the Blizzard style leaves me breathless. If I may say, perhaps there could be a bit more done by way of 'transition' between the Tiers; i.e. from T1 to T2 the stone towers pop up outta nowhere, and from T2 to T3 the whole wooden structure is entirely replaced by a massive stone ziggurat. So... Well, actually now that I bring it up, the TFT Voodoo Lounge is a point against the "Blizzard lazily re-used resources but would've made J.Trolls different". Actually, both the Shadow Hunter and the Voodoo lunge were not made for tFT ; they were unused resources left from the beta stages... They predate the idea of distinguishing new 'Jungle Trolls' from the former 'Forest Trolls'. So it is re-using stuff. I wouldn't count the burrow as troll architecture. Blizzard tried several things with it ; in the playable betas Grunt, Head Hunters and Peons could enter the burrow. The 'troll burrow' name left in the MPQ probably came up from a stage where only head hunters could enter it, just like Riflemen could enter the steam tank ; I guess unlike the 'terran bunker' it would mostly refer to who were going to use it, not which culture conceived it, thought I could be wrong. Yeah, no, I think you're right. I suppose I meant to put that in quotes, because it's nearly obvious that it's not really Trollish architecture. (If anything, I think the name may have come from the fact that even though it's manned by Peons, the projectile is a spear; in fact, an identical spear to the ones the (Troll) Headhunter throws). You know, you're absolutely right; I forgot about that. The VL was present in Beta shots, wasn't it? Hey, that's right. I knew they were around somewhere (thanks for finding them; I couldn't). Well, while we bide our time until Handclaw graces this thread once again with his model-tastic presence, I figured I should continue the conversation on a different thread. On Leadership, I'm pretty partial to the idea of a di-partite government (as it were); basically, Trolls are all about one of two 'paths' in life; the way of the warrior and the way of the wizard (lame). Physical & Spiritual, Mortal & Ghostly, Matter & Energy, blah & blah. I think it makes sense to make each Tribe headed (physically) by a Chieftain/Warlord/Warchief/etc, and (spiritually) by a Witch Doctor/Shaman/etc. One takes care of one 'world', the other the other. The Chieftain makes sure the tribe's physical needs are met (primarily safety), whereas the Shaman makes sure the tribe's spiritual needs are met (esp. appeasing the spirits & communing with the elements & such). This would be beneficial for the campaign; I think it'd be good to focus on the "Warchief" (NoName the Warbringer) and the "Shaman" (NoName2 the Medicine Mon). On Regeneration, I feel like sorta blowing off the whole "Loa" thing as sort of an aside. Ah dannae, I just like the idea of a very physical, 'explainable' regeneration, if you will. I don't know how, but I wanna focus on the idea that it's a very natural thing for Trolls. Part of this is considering/explaining it in such a way that makes it 'believable' (lol)... I am thinking along the lines of "Wolverine-esque". Like, as an example, wounds would heal super-fast, scar-tissue minimal. The Troll body would be extremely good at regenerating most basic injuries. Personally, though, I have a hard time seeing entire bones regrow & such... So take a Troll who has his arm cut off. Will an entire new arm grow back? No way. But grab the severed arm, stick it on the stump, and will it regenerate back together in working order? Sure. What would take a humans months I want a Troll to take weeks, or maybe even days. Fire cauterizes the wound, quenching the 'healing-ness' of the flesh & thus is abhorrent to most Trolls. Now to Deconstruct:... In a world where your enemies regenerate inhumanely fast, what is combat? A lot more nasty, given that your foes literally have to be chopped up, beheaded and/or burned alive to really *kill* them. Lots of grudges, lots of scars. Not a lot of deaths. Moreover, what happens to prisoners with information... What use is torture when they can just heal it all back? Also, from a book I read long ago (would love someone to tell me what it's called), which featured a similar race (in that they regenerated super-fast), a member of that race highlighted an important tactic in 'dealing with' other people of his kind: since they regenerate so quickly, normal wounds that might be debilitating or even mortal to a regular human are paltry to a (whatever). Instead, he elected to inflict particularly painful & long-healing injuries to incapacitate others like him; he cut the tendons in the shoulder & leg, which curl up & take FOREVER to heal properly. Totally incapacitating.